This complete guide to screening and testing software brings you a collection of the 25 top pre-employment assessment tools, together with their key features and pricing details. Finding candidates with the right skillset and a good culture fit is a challenge for every company. Hiring based on resumes doesn’t work anymore, using creative techniques like portfolio-based hiring isn’t suitable for every position, and having face-to-face interviews with every candidate in order to figure out their skills isn’t sustainable either. To make the recruitment process faster, sustainable and more objective, every employer should screen the candidate’s hard and soft skills as one part of the recruitment process. HOW TO CHOOSE THE BEST PRE-EMPLOYMENT ASSESSMENT TOOL? The timing of screening skills. Before choosing the right tool, you should decide whether you want to screen candidates before or after conducting interviews. Testing candidates’ skills before the interviews help to easily weed out unqualified applicants and cut down the time spent on pre-screening, whereas running skills assessments after the first round of interviews help to make the last hiring decision from a few top candidates. The range of testing options. A lot of pre-employment testing tools are solely meant for hiring developers, however, there are a few options that are suitable for various positions. Make sure to check beforehand whether the tool you’re thinking of buying offers customized tests, what kind of skills you can screen (hard skills, soft skills, aptitude tests etc.) and if it is suitable also for non-technical roles. Integrations with Applicant Tracking Systems. If you’re already using an applicant tracking system, you might want to have an option to easily integrate your ATS with your pre-employment testing tool. However, if you’re not using an ATS, or you’re planning on using skills tests in the first part of the hiring process (for instance, instead of collecting resumes), a pre-employment testing tool with a standalone built-in applicant tracking system might be a good choice. Pricing options. Skills assessment tools have many different pricing models like monthly subscriptions, pricing per candidates, pricing per tests etc. If you’re using a skills test in the latter part of the recruitment process and you don’t need to hire very often, it might be wise to choose a ‘pay per candidate’ option. On the other hand, if you’re hiring regularly or you’ve decided to screen candidates’ basic job skills in the first part of your recruitment process, monthly subscriptions might be a cheaper option. The challenge? There is a wide selection of pre-employment testing and screening tools on the market, from targeted testing of technical skills to more general tests to measure candidates’ skills on a wide range of categories. We have done our best to find great options from both sides. Here are our top 25 picks for pre-employment assessment tools that will help you screen candidates’ job-specific skills. What does this tool offer? Hundred5 goes beyond resumes and uses short skills challenges as the initial filter. Candidates apply for a job by taking a short, 10-minute skills challenge. The system then automatically checks the answers and gives you a short list of the best performers based on their actual job-related skills and knowledge, not their keyword resumes. This skills-based pre-screening approach helps companies attract passive candidates, evaluate everyone automatically, and find high-quality candidates faster. – A growing pool of pre-built skills test templates made by industry experts for various job positions. – You can also create your own custom skills tests from scratch. – All skills challenges have customizable time limits, various question types (single/multiple choice questions, file attachments, coding challenges etc. ), and automatic score calculations. – Powerful Dashboard showing performance statistics for each job opening, such as: which channels candidates are coming from, how well your skills challenges are performing etc. Hundred5 Pricing: $190/month for 1 job opening (with unlimited candidates and unlimited access to all skills tests and other features). Sign up for free here. Does it offer a free plan? Setting up a test and publishing a job opening is completely free – you start paying only once you’ve gathered candidates and want to contact them. What does this tool offer? QuodeIT helps companies screen software developers faster and better in order to avoid taking interviews of people who look great only on their resumes. Test templates: Free tests and questions available. Also a possibility to create or buy customized tests. Analytics: Live rankings and analytical reports on candidates that can be filtered on different parameters. What does this tool offer? Codility streamlines and accelerates tech recruiting by automating sourcing, screening and interviewing. Test templates: Free questions (extra questions available with upgrade). Also a possibility to create or buy custom tests and questions. Built-in applicant tracking system: CodeLive which enable you to interview, interact and engage with candidates. Analytics: A ranking system that lets the employer objectively assess and rank the candidates. Codility pricing: $159/month for 15 assessments and single-user. Pricing for multiple users is based on special requirements. Does it offer a free plan? 7-day free trial period available. What does this tool offer? HackerRank offers multiple programming tests to help companies hire the right engineers faster. Hackerrank pricing: Pricing dependent on requirements. Does it offer a free plan? 14-day free trial period available. What does this tool offer? Classmarker is an online testing and quiz maker for business and education purposes. Test templates: No free tests available. Custom tests/questions can be created. Classmarker pricing: $39.95 or $79.95 a month. Does it offer a free plan? 30-day free trial period available. What does this tool offer? Interview Mocha is an online skills assessment platform with 100+ IT job roles, 700+ IT skills, 100+ next-gen digital transformation skills, 20+ coding languages, 20+ domain skills, 50+ aptitude, and cognitive skills. Who can I hire with it? Various job roles for entry-level, experienced, and lateral hiring. How to source candidates: Via public share URL or by inviting candidates to take the test. Test templates: 1000s of quality questions available, plus options to create custom tests. Integrations: 1-Click integration with Greenhouse, Workable, Bullhorn, Workable, Bullhorn, iCIMS, Smart Recruiters, Zapier. Analytics: Customized Performance Report, Comparative report, Advanced filtration and search, Weekly email analytics, Shareable report, etc. Interview Mocha ricing: Starter plan @ $150 per month, Business plan @ $500 per month, and a Custom plan. Does it offer a free plan? No, however customers can request for a demo and evaluate the software themselves. What does this tool offer? Pymetrics applies AI to identify talent bias-free and predict job performance based on complex neuroscience data. What does this tool offer? Eskill offers custom-made skills assessments to screen candidates faster and more accurately. Pricing: $300, $350 or $729 per month. Does it offer a free plan? Free trial period available. What does this tool offer? Vervoe helps companies hire faster using automated interviews, assessments and online simulations based on interview scripts. What does this tool offer? Exert Rating offers over 800 tests to help companies hire the right people affordably and efficiently. Pricing: Pricing per test. Base price $10 per test, down to less than $4 per test for purchases over 1000. What does this tool offer? Mett is an online assessment software for recruitment, training, certification, and exams. What does this tool offer? Criteria Corp helps companies make informed hiring decisions using different pre-employment tests, including aptitude, personality, and skills tests. Test templates: Portfolio of tests/questions available which can be customized. You can also create your own tests/questions. What does this tool offer? QuizCV is a platform and marketplace for online pre-employment testing. Test publishers can prepare tests and sell to companies so that companies can make better hiring decisions. What is this tool for? Lytmus helps companies hire developers for Web, Ops, QA, and Data roles using real-world tasks, not brainteasers. Pricing: $250 or $500 per month. Also offers custom plans. What does this tool offer? CodeFights applies core game mechanics to transform practicing programming skills into a fun and addictive game while helping talented candidates to find new job opportunities. What does this tool offer? Weirdly offers pre-employment quizzes to build diverse teams who are aligned with company values. What does this tool offer? Qualified offers automated coding assessments and pair-programming to help companies hire the best talent. What does this tool offer? Athena Quotient offers pre-employment tests that measure judgment. Analytics: Various reports about the candidate, like first impressions and even stress. What does this tool offer? Prevue HR offers aptitude, personality and motivation assessments. What does this tool offer? Devskiller offers programming tasks and coding skills tests to help companies screen developers. Pricing: $109 or $399/month. Custom plans also available. Free trial available for 15 candidates. What does this tool offer? Tests4Geeks offers programming skill tests to help companies hire better developers. Pricing: $29.95 for 3 tests, $59.95 for 10 tests or $99.95 per month. Does it offer a free plan? First two tests are free. What does this tool offer? TestDome offers automated testing of programming skills. Pricing: $100, $400, $1000 or $2400 per month. What does this tool offer? Talview is an AI-enabled recruitment platform with video interviewing, online assessments, behavioral insights, chatbot, simulations, and gamification. What does this tool offer? Codeassess offers programming tests & competitions to screen and shortlist software developers faster. Pricing: $49, $79, $199 or $399 a month. Custom plans also available. What does this tool offer? Skillmeter helps companies create custom skills tests to measure candidates’ skills and enhance the hiring success. What does this tool offer? 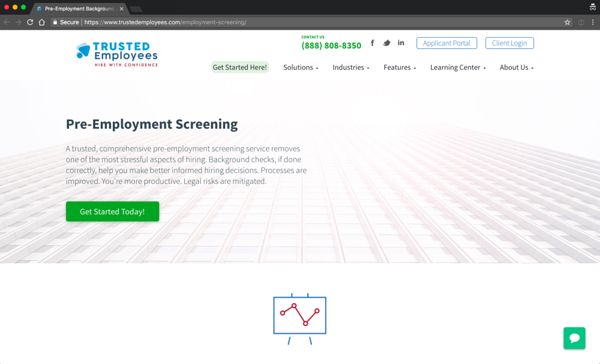 Trusted Employees provides businesses, non-profits, and volunteer organizations with a tailored and compliant approach to background screening. Pricing: $29, $49 or $69 per 1 screening (depending on feature usage). Now it’s up to you to choose the tool that works the best for you! PS! If you’ve heard of any other pre-employment assessment tools, feel free to drop a comment below. Any suggestions are welcome!